Chandeliers are lighting fixtures that have been used for hundreds of years and they continue to be popular even in the modern day. While it may not always be possible to get large ballroom style chandeliers installed in your home, you will find there are a number of new and innovative chandelier designs and styles available on the market, that are ideal for residential and commercial applications. While this may seem like just a lighting fixture that you can easily install yourself, its best to hire the services of Residential Electricians in Sydney to install these in your home. An experienced electrician will help you choose a good fixture and will provide you all the information you need about the different types of installations you can choose from. Every room is different and the chandelier you choose would be based on the kind of effect and ambience you want to create on your property, the look and styling of the décor in that space, and other aspects like your preferences and budget. Entryways- This becomes an ideal spot for a chandelier installation. This is especially true if the entryway space has a high ceiling. A chandelier can create a dramatic effect in this space and will also illuminate the area very well. Dining area- Most homeowners like to get a chandelier installed in their dining room. The piece you choose would have to be proportionate to the dimensions of the room. Since the chandelier will be installed right above the dining table, it’s important to ensure that you take the height of the ceiling into account as well. Kitchen- Many people wonder whether this functional space lends itself well to embellishments like chandeliers. The fact is today you can get chandeliers made of wood, glass, metal and a number of other natural and man-made materials. Choosing the right one can add a very distinctive look to the space and it can become the focal point of your dining room as well. Living room- Adding a chandelier to you living room is one way to create a very luxurious look to the space. Even the most minimalistic décor styles go well with a chandelier installation. You will find a lot of chandelier styles that are ideal for bathrooms, sunrooms, home offices and entertainment rooms etc. 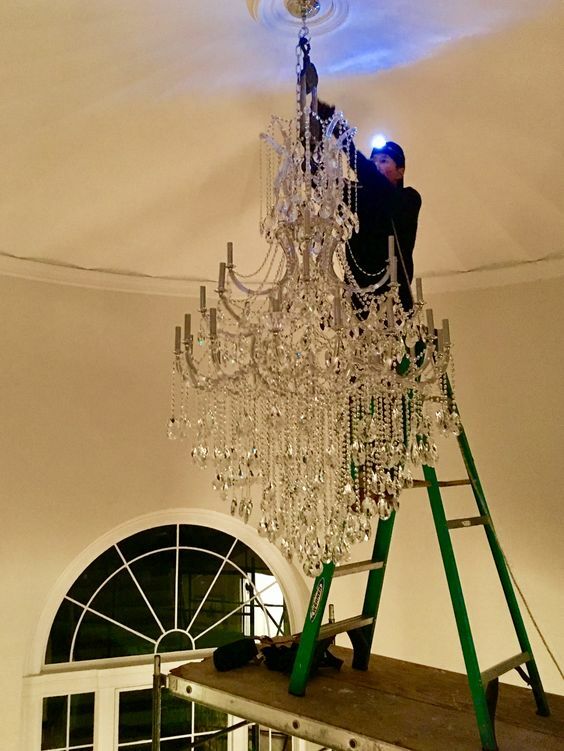 Quick Connect Electrical has been in this business for a number of years and knows what it takes to provide customers with cost-effective chandelier installation services. To check if we serve your area, just enter your pin code in the box on the right of the page. See what our customers are saying about our company & services. For an emergency electrician in Sydney, any time of the day or night, call us at this number- 1300 725 894.